Sarai's family was visited by Turkish local association. 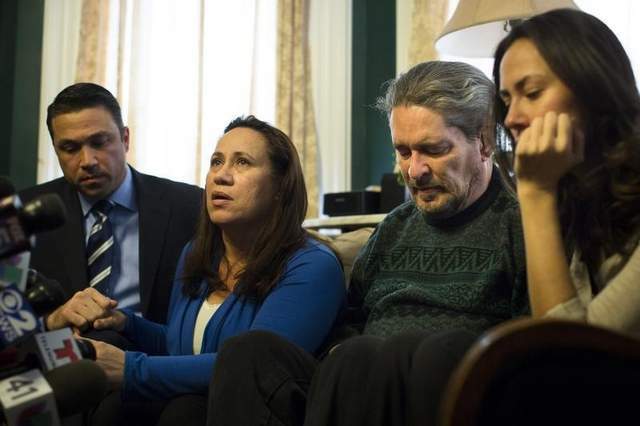 The mystery surrounding New York mom Sarai Sierra’s murder has not yet been solved. Like everybody else, I’m trying to figure out what went wrong. In no way do I want to say anything that might offend her memory or her family. If she had not been murdered, she would probably be telling her kids and relatives of her trip right now, showing her photographs to them. None of us would have heard her name... She would have been one of the happy 25 million tourists who visit Turkey. But something went wrong, she encountered brutality; under what circumstances, how and why, we do not yet know. Was her murderer(s) a pervert, a thief, a sniffer, a criminal she met through the web or is the reality something completely different from any option we’ve imagined so far? This might be far-fetched, but I see some kind of a parallelism, albeit perhaps a rough one, with what happened to the young British schoolmistress Adela Quested in the book “A Passage to India” and Sierra’s ill-fated journey to Turkey. In the book “A Passage to India,” which later became a film, Adela Quested makes a trip to the “Marabar Caves.” She later describes it in court, as that she remembers an echo, an echo in the cave that has disconcerted her so much that she temporarily became unhinged. She was in shock. Most probably as a first time overseas traveler Sierra experienced her own shock while in Istanbul. She found too many attractions, people were kind to her, she was able to contact her followers and meet some of them who probably looked up to her with admiration. She was able to take photos full-time, go around the city on her own schedule, travel to two other European destinations and come back which all put her, I imagine, in a different dimension. One starts acting differently while travelling. It happens to me also. I have mostly seen it in travelling Americans: You switch into a different mood or mode. This is probably due to the fact that while travelling you encounter the most professional of service staff. There are people around you who smile at you, talk to you extremely nicely. The taxi driver opens doors for you, helps with your luggage. The airport is another highly civilized venue where you also meet the best serving staff or other passengers who have similar feelings, who are on their best behavior. (Well, generally…) The airline personnel is there to make you more comfortable; hotels, restaurants, guides, museums, wherever you go, you are served, made to feel at ease, given information, entertained… Moreover, if you meet a few good people, then you are completely immersed in this positivity. You see a silly smile on the face of tourists all the time – that must be the reflection of this traveling mood, this ecstasy. You are exposed to so much of this affirmative air that you start thinking differently, your perception gets blurred. You also become positive, letting go of all negative thoughts. You gradually drop off your personal safety measures. Then you completely let them go… For example you leave your bag unattended, first for short periods and then the period of confidence extends. You see no harm trusting a person you have just met, you feel confident to explore new places regardless of the time of day or location. When somebody offers you something, you take it without a second thought. I don’t know if there is a scientific explanation behind letting your guard down or relaxing your basic safety measures. This is what probably led to Sierra’s tragic end. She was happy, she was achieving what she wanted and she was having positive experiences. She probably met her murder or murderers, or maybe she never met them, but was attacked from behind, while she thought she was in a safe place. I’m only imagining what Sierra felt. She was 33 years old with two kids, which means she gave birth to them in her early 20s. It is reported she had marital problems. She had newly discovered a love and talent for photography and in one year she had amassed thousands of followers on Instagram. She was just trying to find herself. And she did it, she was being herself. What bliss.